Shane’s Granny Rozell is a 94 year young ball of fire! There is no other way to describe this wonderful lady. In fact both of Shane’s grandmothers (the other being Granny Ina, a Texas Ranger’s FANatic) are amazing and you will find I talk a lot about them, the way they inspire me and influence me everyday. But, back to Granny Rozie. She is famous for her pecan pies. Every reunion, holiday or family gathering she will bring a pecan pie. When she moved into a retirement home last year, Shane and I helped clean out her home. I stumbled upon a hand written recipe for Pecan Pie and secretly hoarded it away. I knew that it had to be framed and kept in a special place. Now, I will NEVER accuse myself of being a perfectionist or even close to it for that matter. Saying that, I am sure there are better ways to create the same project; probably ways to archive and preserve the original paper, to mount the recipe and better paper to use; however, this serves the purpose for me. Maybe this will serve as inspiration for you and you can expand on the same project and make it better. The main idea behind this was to honor a special lady and something to give us memories of sweet Rozie with. 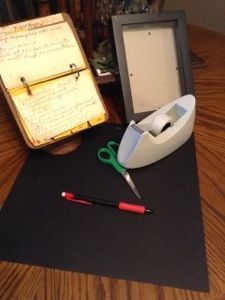 So, here are my tools and supplies to frame Granny Rozie’s Pecan Pie Recipe: Hand Written Recipe Card (I used a pecan pie recipe and a pecan and coconut frosting recipe), black scrapbook paper, a shadow box frame, tape, pencil and scissors. 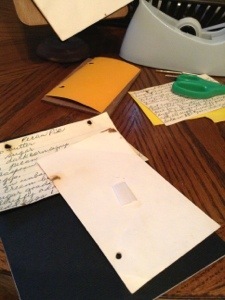 Granny Rozelle kept a lot of her recipes in a Rolodex type recipe file (it will be a future up-cycle project for sure.) I love how time has browned the edges and given the cards a well worn look. I can just look at one and feel the love that went into baking and making each recipe. 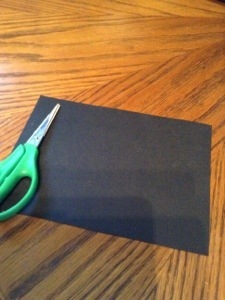 First thing, I took off the back of the shadow box frame and used it as a template to trace the shape onto black scrapbook paper and then cut the shape out. 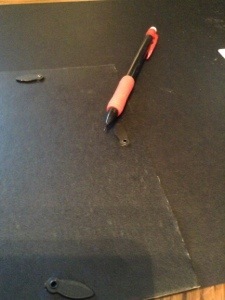 Using the old fashion technique of rolling a piece of tape into a circle, I placed several onto the back of the black rectangle and taped it into the inside of the frame backing. 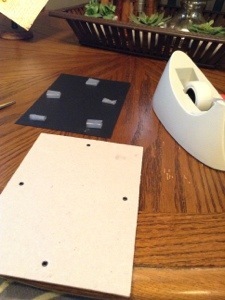 Of course, a practical person would have used double sided tape or mounting squares….hey, I just grab what is closest at the time. See, now you are even seeing that my picture will never appear next to the definition of a perfectionist. 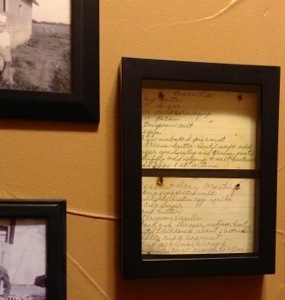 Once again, using the ‘ol roll and tape method, I taped the recipe cards to the paper, carefully eyeing the placement. Of course you could use a level or ruler, but eyeing it works for me. 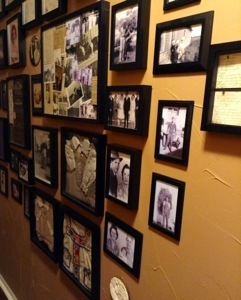 After putting the shadow box back together, we hung the recipe card in our hall, making it a wonderful addition to our Family Memory Gallery. More on that project later. For now, hats off to the amazing life of Granny Rozell and her awesome pecan pies!